AIIMS Bhopal Recruitment 2019: AIIMS Bhopal / www.aiimsbhopal.edu.in is conducting recruitment processes to fill 142 vacancies. As of now, there is one recruitment drive going on for 142 Non-Faculty Group A, B and C Posts. AIIMS Bhopal Recruitment 2019 - Walk in for 41 Assistant Professor Posts in AIIMS Bhopal, Bhopal, Madhya Pradesh on Contract Basis. Candidates are invited by AIIMS Bhopal to attend walk-in-interview to be held on 10 Mar 2019 09:00 AM for 41 vacancies. AIIMS Bhopal Recruitment 2019 - Job notification for 231 Non-Faculty Posts in AIIMS Bhopal, Bhopal, Madhya Pradesh on Contract Basis. Applications are invited by AIIMS Bhopal on or before 15 Feb 2019 for 231 vacancies. 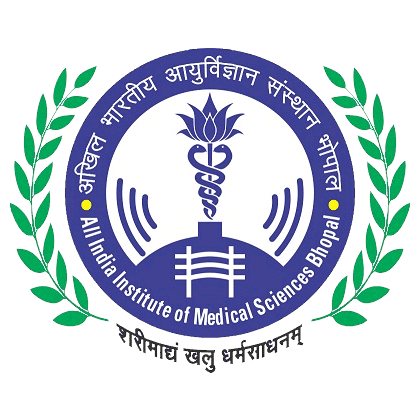 AIIMS Bhopal Recruitment 2019 - Apply Online for 119 Faculty Posts in AIIMS Bhopal, Madhya Pradesh on Direct Recruitment on Regular basis/Deputation basis/Retired Faculty, as Consultant on Contractual basis. Online Applications are invited by AIIMS Bhopal from 21 Jan 2019 to 06 Mar 2019 for 119 vacancies. AIIMS Bhopal Recruitment 2019 - Walk in for 14 Consultant Posts in AIIMS Bhopal, Madhya Pradesh on Contract Basis. Candidates are invited by AIIMS Bhopal to attend walk-in-interview to be held on 01 Mar 2019 09:00 AM for 14 vacancies. AIIMS Bhopal Recruitment 2018 - Job notification for Ph.D. Course Admission 2018 in AIIMS Bhopal, Madhya Pradesh. Applications are invited by All India Institutes of Medical Sciences Bhopal on or before 30 Nov 2018. AIIMS Bhopal Recruitment 2018 - Walk in for 96 Junior Residents Posts in AIIMS Bhopal, Madhya Pradesh. Candidates are invited by All India Institute of Medical Sciences, Bhopal to attend walk-in-interview to be held on 08 Oct 2018 at 10:00 AM for 96 vacancies. AIIMS Bhopal Recruitment 2018 - Walk in Interview for 24 Assistant Professor Posts in AIIMS Bhopal, Madhya Pradesh on Contract Basis. Candidates are invited by AIIMS Bhopal to attend walk-in-interview to be held from 25 Jun 2018 27 Jun 2018 09:00 AM for 24 vacancies. AIIMS Bhopal Recruitment 2018 - Job notification for 49 Group C Posts in AIIMS Bhopal, Madhya Pradesh on Deputation Basis. Applications are invited by AIIMS Bhopal on or before 16 Jul 2018 05:00 PM for 49 vacancies. AIIMS Bhopal Recruitment 2018 - Walk in for 50 Junior Residents Posts in AIIMS Bhopal, Bhopal, Madhya Pradesh. Candidates are invited by AIIMS Bhopal to attend walk-in-interview to be held on 06 Jul 2018 at 10:00 AM for 50 vacancies.